A familiar disease to many in Alabama, sinusitis refers to an inflammation of the sinus cavities usually as a result of bacterial infection. Many times just making the diagnosis of a sinus infection may be challenging. Differentiating a viral infection or an allergy condition from sinusitis is important when choosing the right and appropriate medications for treatment. Furthermore, a common cold or allergy condition can “set the stage” for a sinus infection to become the main problem. Dr. Robertson and his staff will spend the time required to determine the best medical treatment plan for your individual condition. A “one plan fits all” is never appropriate. Most patients who suffer from an acute case of sinusitis respond well to medical treatment and return to their everyday activities within one to two weeks. When sinusitis persists over months, or when recurring episodes occur frequently, Dr. Robertson will work towards pinpointing the nature of your specific problem. At times, underlying medical problems or conditions can contribute to the chronic nature of sinusitis. The Southeast Region of the United States is known to be especially problematic for allergy sufferers. Some individuals are at an unfortunate disadvantage secondary to environmental allergies. Whether dust mites, ragweed, or the family pet, allergens can add additional inflammation to both the sinuses and bronchi in the lungs. Therefore, certain patients will be at increased risk for sinusitis and bronchitis because of exposure to allergens. Dr. Robertson performs state of the art epicutaneous (prick) and intradermal skin testing to identify possible allergens. Researchers have identified more than 150 primary immunodeficiency disorders (PIDD). These disorders are usually genetic or inherited. The most common PIDD’s are caused by an absence of certain forms of white blood cells (an important part of the immune system). Our staff is fully capable of obtaining the appropriate lab work to investigate this possibility. When appropriate and aggressive medical management is unsuccessful in tbreating chronic sinusitis, it is often related to the presence of anatomic abnormalities in the sinuses either of a structural nature (narrowing of sinus drainage pathways) or physiologic abnormality (mucosal thickening or polyps within the sinus cavity). CAT scan (CT) imaging of the sinuses is required to determine if this is part of your particular problem. While systemic therapies such as antibiotics, decongestants, and steroids may be helpful, we also try to use topical therapies such as saline irrigation and steroid solutions and sprays in the treatment of both chronic and acute sinusitis. When chronic sinusitis does not respond to medical management, a surgical procedure may be indicated. Diagnostic measures, such as nasal endoscopy and CT imaging of the sinuses can help determine whether surgery is indicated. 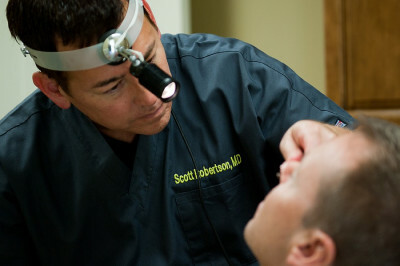 Functional Endoscopic Sinus Surgery (FESS) and Balloon Sinuplasty are two procedures frequently performed by Dr. Robertson. Check out Dr. Robertson's interview on Fox 6!